Who doesn’t love an easy, delicious dinner that can be on the table in 30 minutes? 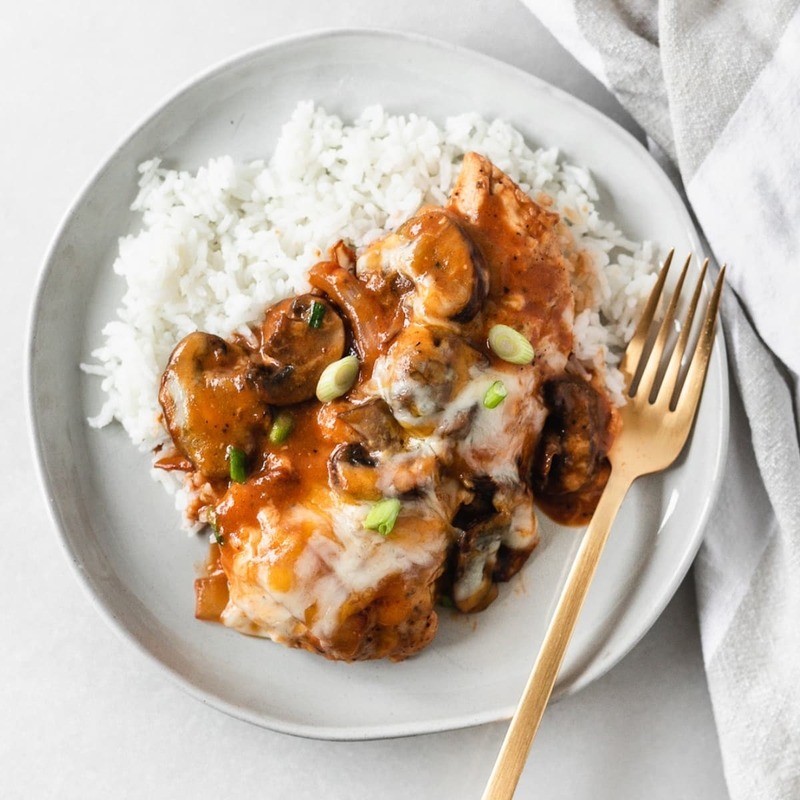 You can never have too many family friendly, no-fuss dinner recipes, and this one pan BBQ mushroom chicken is just that! This recipe is inspired by a chicken dish at one of our favorite local restaurants. It’s a juicy chicken breast in a sweet mustardy BBQ sauce with sautéed mushrooms and onions, all topped with melted cheese. So. Good. The one at the restaurant has bacon, so of course, Mr. Table asked where the bacon was when I made this the first time. 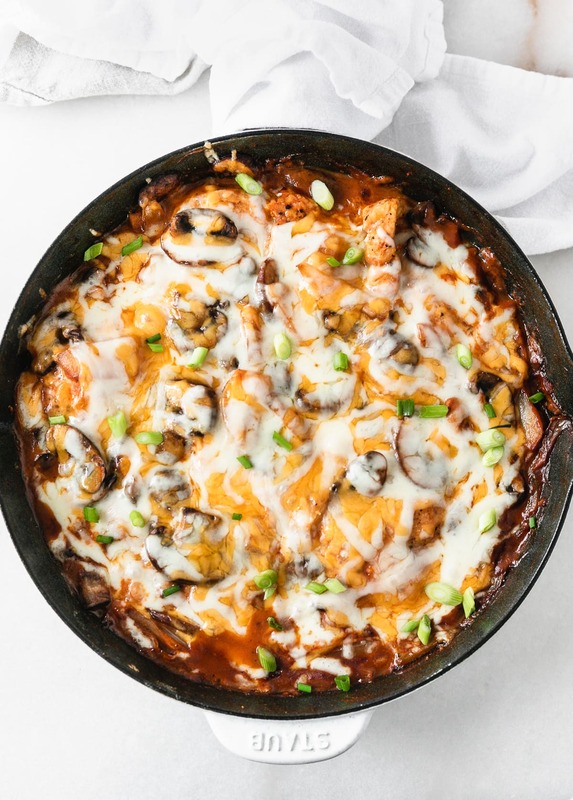 In my opinion, this one pan BBQ mushroom chicken is so flavorful and delicious that it doesn’t need any bacon. It’s quickly become one of his favorites, even without the bacon. Though if you must add bacon, be my guest. 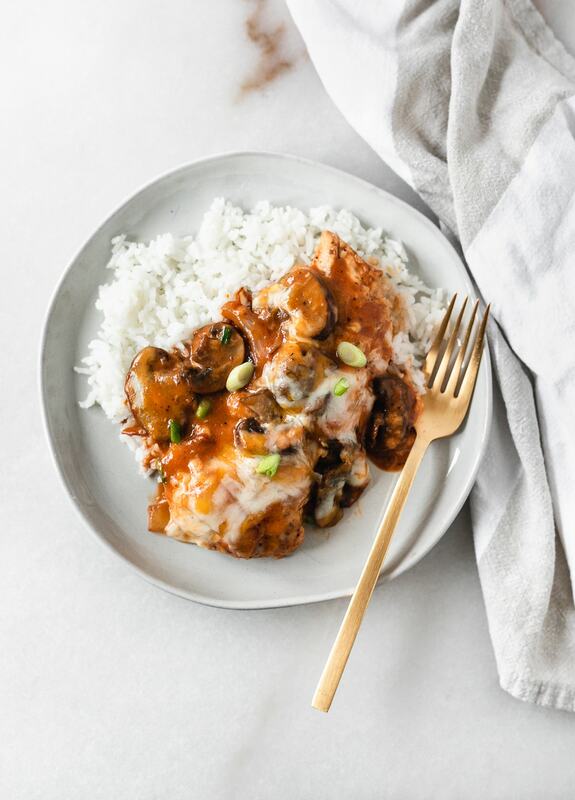 Besides the delicious flavor, what really makes this BBQ mushroom chicken dish a winner is how dang easy it is to make. You only need one skillet and a few simple ingredients, and you’ve got dinner on the table in 30 minutes! The chicken is seared on the stove in the skillet, then you use the same skillet to cook the mushrooms and onions, stir in the sauce, and put the chicken back in the pan to finish cooking in the oven. It’s so simple and perfect for weeknight meals, and the best part is that you only have one pan to clean when you’re done! I like to serve this dish with a green salad or some simple steamed green beans and a cooked whole grain, such as quinoa or brown rice. It’s a delicious, filling, balanced meal that provides plenty of protein and fiber. But the real win is that the whole family will love it! Heat oven to 375°F. Place a cast iron skillet in the oven to preheat. Cut each chicken breast in half vertically so that you have 4 thin chicken breasts. Sprinkle with salt and pepper on both sides. Once skillet is hot, place on the stove top over medium heat. Add 1/2 tbsp of the oil and sear chicken breasts for 3-4 minutes per side, or until lightly browned. Transfer to a plate. Turn heat to low and add remaining oil to skillet. Add onions and mushrooms and cook, stirring, until softened, about 5-10 minutes. Meanwhile, whisk together BBQ sauce, mustard, vinegar, pepper and paprika. Pour over onions and mushrooms and stir to coat. Add chicken back to the skillet and place in the oven to finish cooking, about 10 minutes. Remove skillet from oven and spoon mushrooms and onions on top of the chicken breasts. Sprinkle evenly with cheese and place back in the oven until cheese is melted. Serve sprinkled with chopped green onions (optional).